It is so fun to see the boys hang out together. In case you don't know. 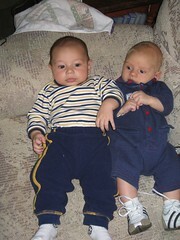 My sister and I had the first 2 grandsons 5 weeks apart. Gavin and Isaac are so cute together. The competition has begun. I had to go out and buy Gavin a pair of identical shoes. Aren't they cute? To see more photos click on this one and it will take you to our flickr account.